Fotos by Albuquerque Dreamers in Action: Albuquerque Dreamers in Action is a community youth organizing project focused on the DREAM Act, enagaging Latinos to attain higher edu. & immigration reform. Youth in New Mexico know first hand what it means to confront corporate media’s perpetuation of stereotypes often used to drown out real voices for the benefit of the bottom line. Not to mention the onslaught of profiling on the streets normalized to sound to the public as just “security” without a critical questioning of the use of that word in terms of who’s security is most valued. Being an active youth dedicated to social justice and civic engagement is an important and noble example for our country but it is often left out or worse, its just demonized. Combine this with the reality of being a young immigrant of color faced daily with the gauntlet of misrepresentations and the targeting by authorities due to the policies constructed for the growth and profit-schemes of the private prison industry. 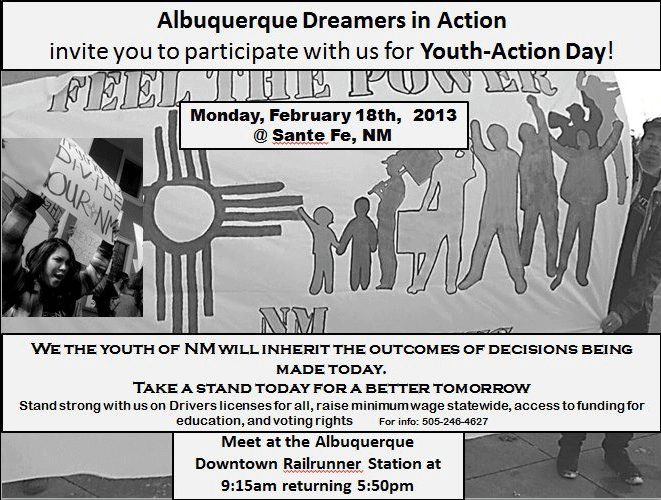 Today Encuentro would like to highlight today’s action at the New Mexico State Legislature 2013 Youth-Action Day. Their call to action is simple truth we need to follow, “We the youth of NM will Inherent the outcomes of decisions being made today. Take a stand today for a better tomorrow…” For this legislative session they invite us to stand strong and inform our leaders about the importance of Drivers licenses for all, raising the minimum wage statewide, as well as more access to funding for education and voting rights.